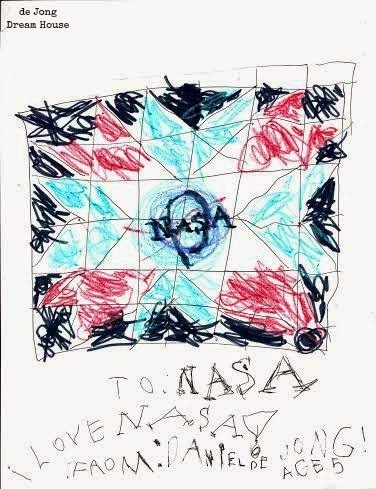 Our five-year-old is deep into his obsession with space. I am deep into my obsession with quilting. It's not often that these two passions meet, but thanks to astronaut--and fellow Minnesota native--Karen Nyberg, they have. 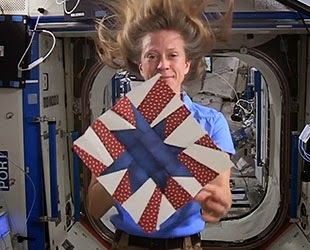 Check out this video of the first quilter in space! 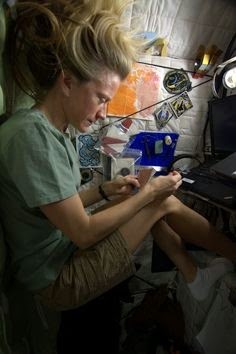 Take a look at her quilting space in the International Space Station! And I'm pretty sure there's never been a more beautiful display wall. 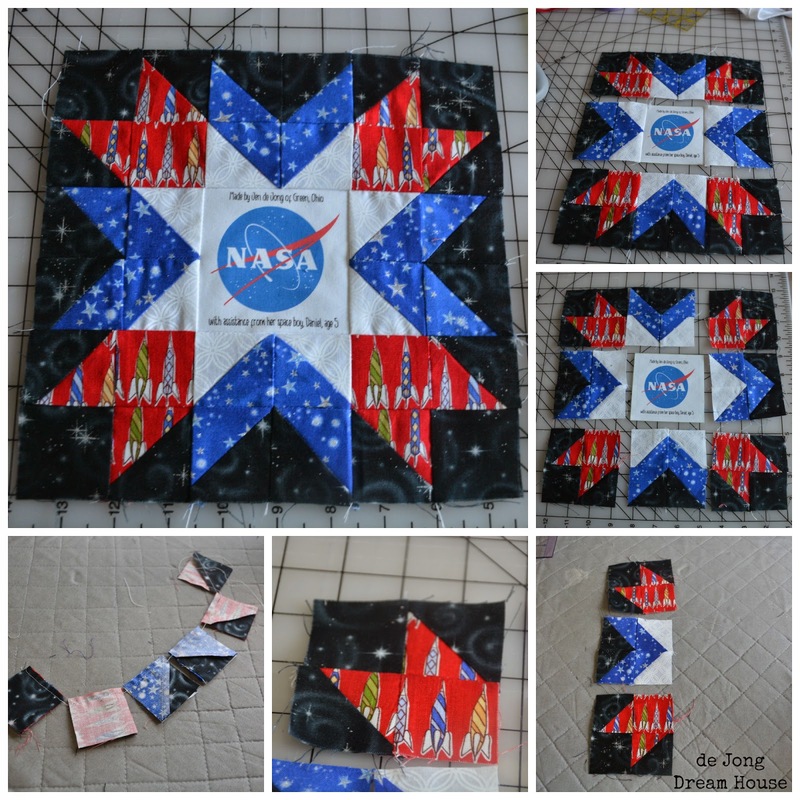 She also made this star block during her stay 220 miles above the Earth. 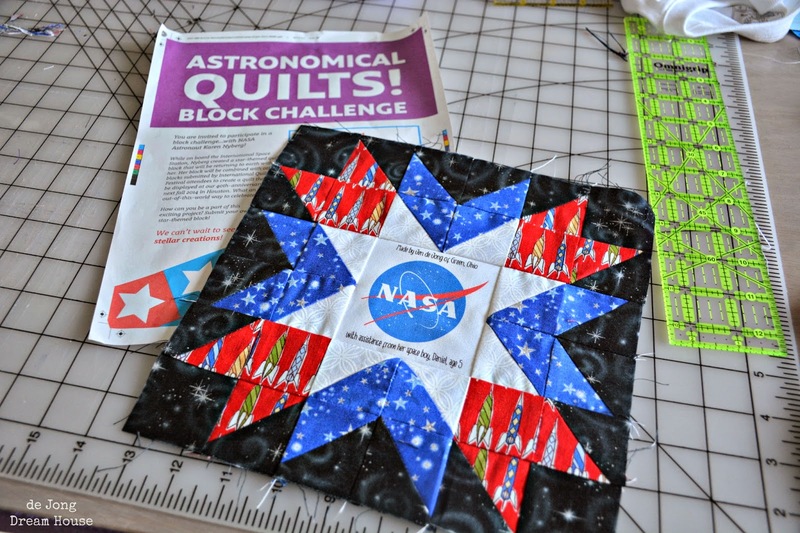 This block is the first in a new Star Block Challenge presented in cooperation between Karen, NASA, and the International Quilt Festival. 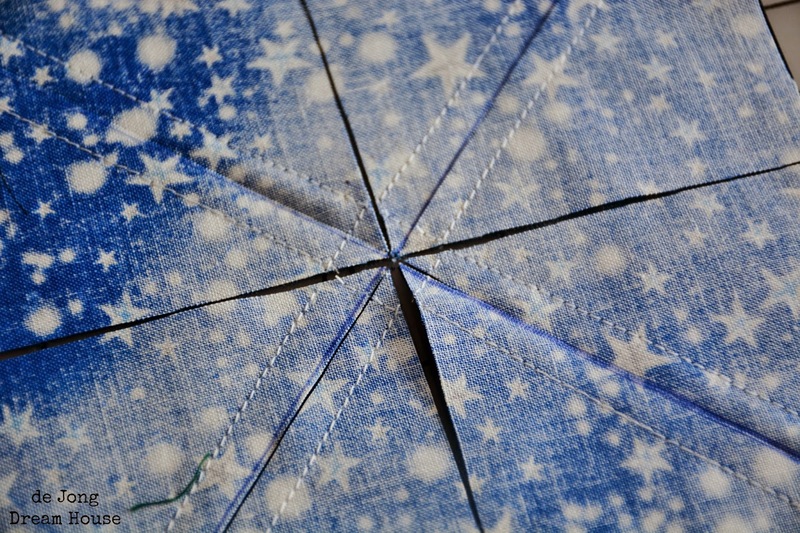 If you're a quilter (or want to be), create your own star-themed quilt block by August 1, 2014. Click here to see the PDF in a larger size. 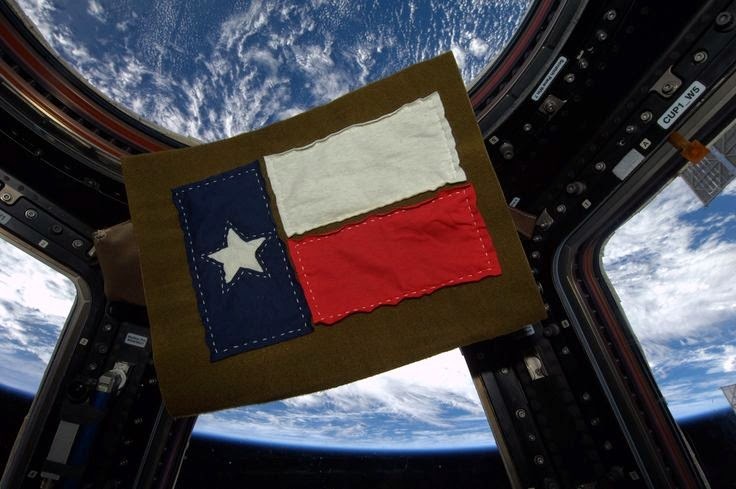 Houston, Texas is home to both NASA's Johnson Space Center and the International Quilt Festival. 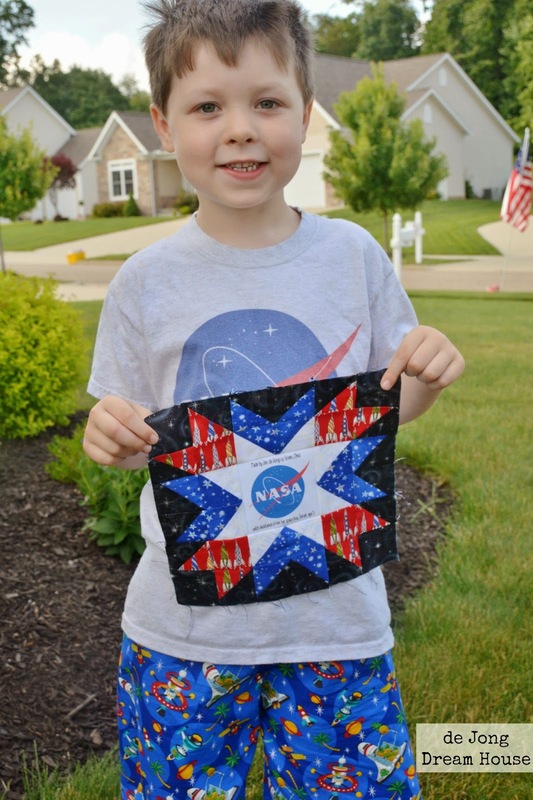 According to Rhianna Griffin, a spokesperson for the International Quilt Festival, nearly 600 blocks have already been submitted from all corners of the world, including Australian, Brazil, Canada and Ireland. The blocks will be pieced and on display at the annual festival in Houston this fall before being permanently display at NASA headquarters. 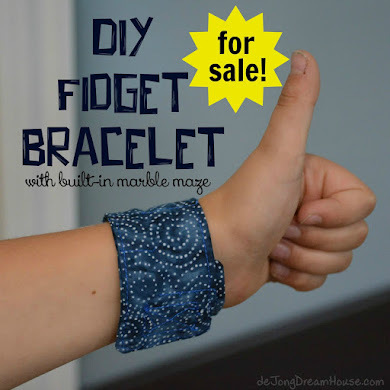 Clearly, this was a project both my son and I could get behind! I use PowerPoint to design a block. The only requirements were that the finished blocked needed to be some variation of a star and have a finished size of 9" (unfinished 9.5"). I chose red, white, and blue as the primary colors to represent both the USA and the Netherlands (to honor our dual nationality family--do you see the red tulips?). I used black along the edge to represent space, and the blue arrows to express exploration. I realized when I was making this that 32 2" squares don't leave a lot of room for error! The 3.5" NASA square seemed positively huge in comparison! 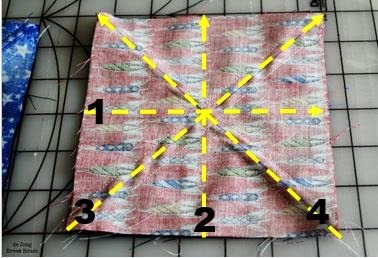 I started with the HSTs by cutting 6" squares as follows: 2 blue, 2 black, 1 red, 1 white. I learned a new trick while making this block, and it was really handy for making 8 little half square triangles (HST) at a time. First, I drew an X on one 6" square, then secured it to another 6" square, right sides together, with hair clips. 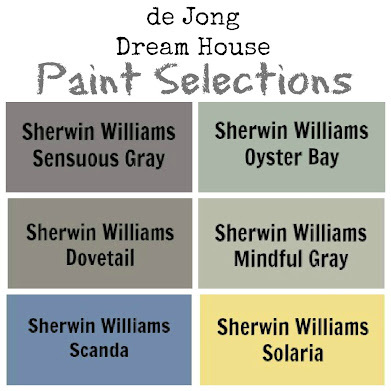 (Refer to the chart for color pairings). 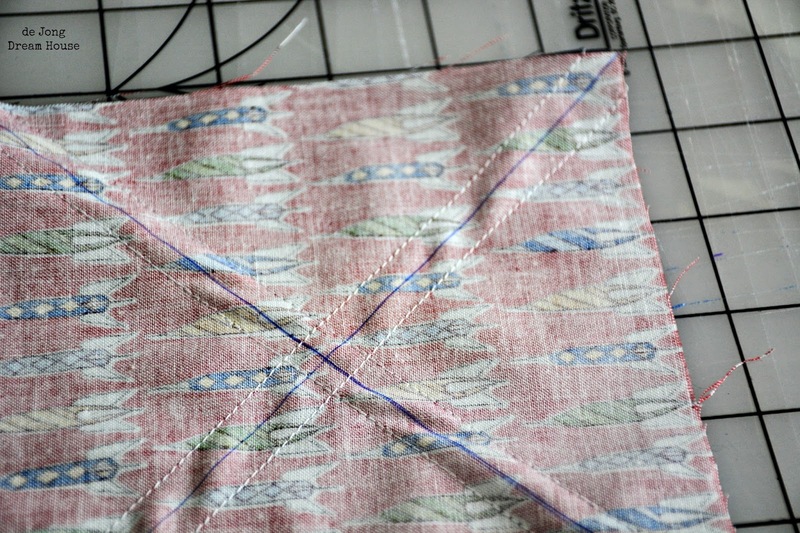 Then sew a 1/4" seam on either side of both lines. 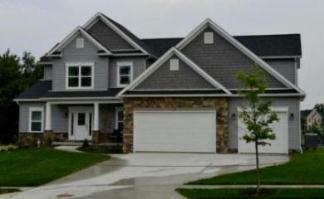 Here's where the magic happens. 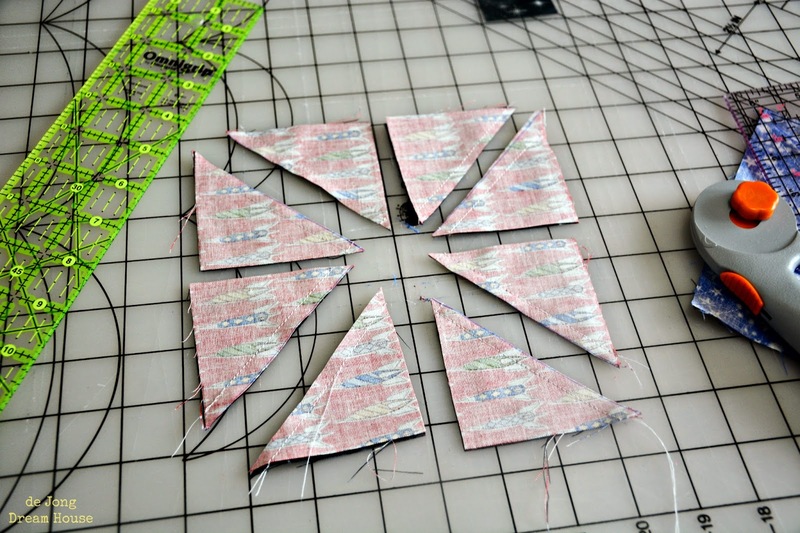 By making four cuts, you end up with eight HSTs. Repeat with all three blocks. And voila! Eight half square triangles! 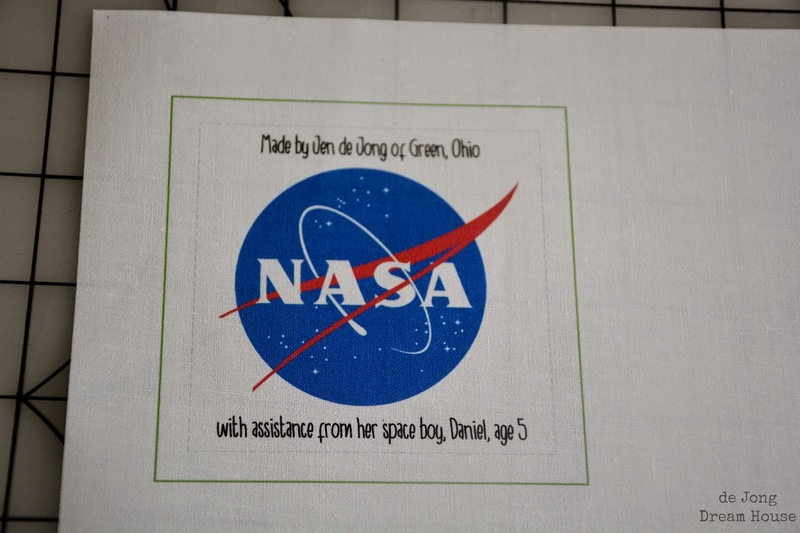 I copied the NASA logo from the web and used it to design my middle 3.5" square in PowerPoint. I added the dotted line around the inner 1/4" to make sure my words weren't cut off when stitched to the other pieces. 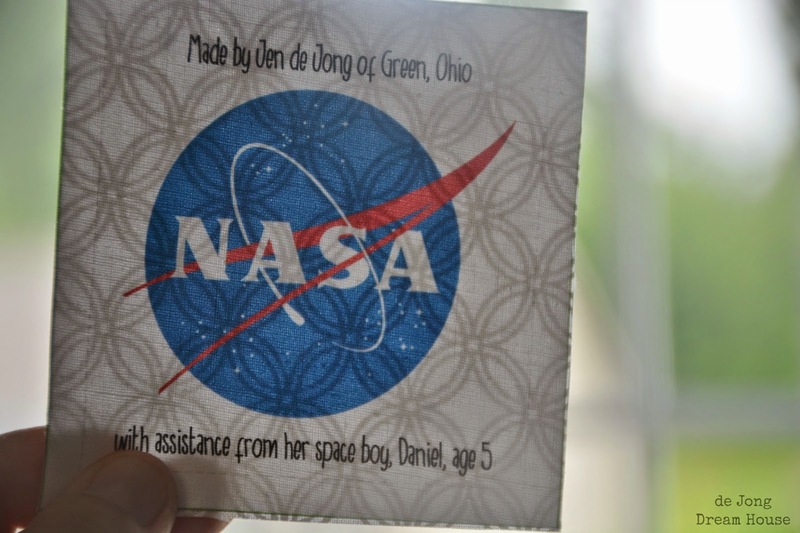 I printed the NASA square onto printable fabric. I should have used sew-in fabric rather than iron-on, but it worked out okay. I ironed the square onto the same white fabric I used on the rest of the block. After this, the block came together quickly. Close up of the center. And done with a month to spare! D drew this picture to go along with our block. If you have made (or are will make a block for this project), post a link below. I'd love to see what others are creating! My son would be in heaven! 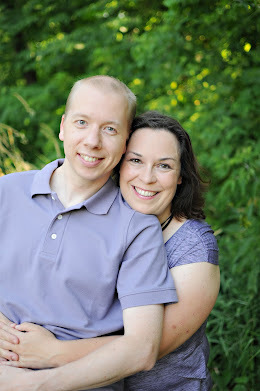 I'm really hoping to get to the quilt show this fall. 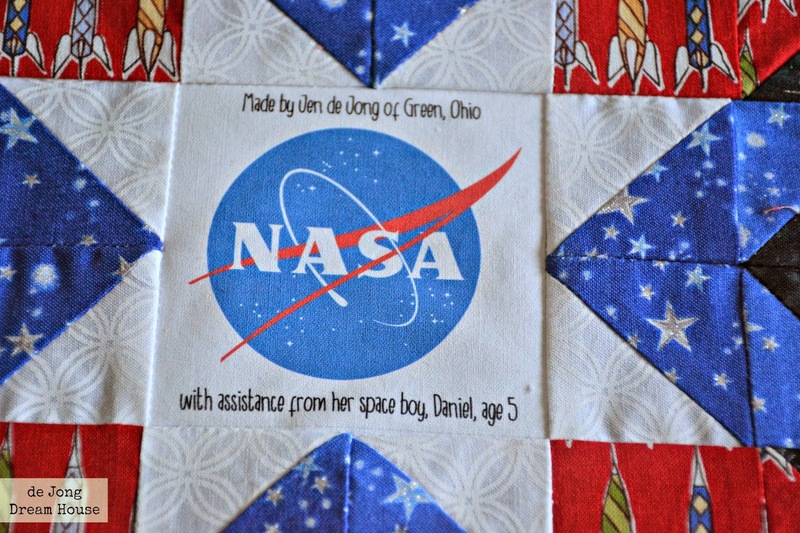 That's so cool she quilts in space. And I like your block too! Navy Wifey Peters @ The Submarine Sunday Link Party! thank you! And WOW! That quilt in your photo is phenomenal! Did you post about it? I'd love to read more about it. Love your quilt block! It's fun when the family interests all mesh for a project :) I had a nod to our nationality in my challenge block as well (my April 27th post). Oh my goodness! Thanks for letting me know, Mary!